This book is just fun to read! Carl Sagan is brilliant at taking the most complex and interesting theories of astrophysics (as well as biology, chemistry, etc.) and making them accessible to anyone. He also takes the great scientific discoveries throughout the ages and puts them in their historical, social, and cultural contexts. So you get a sort of history of science, with its proponents and opponents. The things revealed within these pages gives you the sense that the nature of reality is a sort of science fiction in its own right, with mind bending possibilities. One of his proteges is actually Neal DeGrasse Tyson, another well known and brilliant scientist. If you like him, you'll love Sagan! His Emmy- and Peabody–winning television series, Cosmos, became the most widely watched series in the history of American public television. 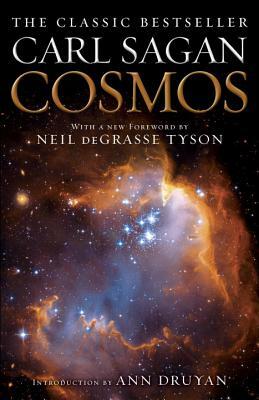 The accompanying book, also called Cosmos, is one of the bestselling science books ever published in the English language. Dr. Sagan received the Pulitzer Prize, the Oersted Medal, and many other awards—including twenty honorary degrees from American colleges and universities—for his contributions to science, literature, education, and the preservation of the environment. In their posthumous award to Dr. Sagan of their highest honor, the National Science Foundation declared that his “research transformed planetary science . . . his gifts to mankind were infinite.” Dr. Sagan died on December 20, 1996.